Info "My poster is peeling off! Get it up there! Get it up there right!" Poster Child is one of Wario's microgames in WarioWare: Smooth Moves. It uses the "Remote Control" form. Its name is a pun on "poster child", a child with a disease who is pictured on campaign posters. 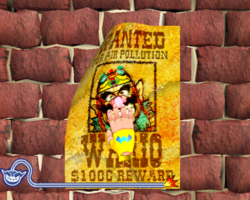 During gameplay, a poster of Wario (which says "Wanted for Air Pollution") is hanging on the wall, but one of its corners is falling off. The player must use the Wii Remote cursor to paste it back on. If the player can get it on before time runs out, Wario's head will jump out of the poster. This page was last edited on February 18, 2018, at 20:12.